A New Jersey Democrat running for Congress told local reporters he isn't in favor of a fast repeal of President Donald Trump's tax reform law, but his website says otherwise as he calls for voters to take action against the tax reform law. Andy Kim, who is running to unseat Rep. Tom MacArthur (R., N.J.) in the state's 3rd Congressional District, said he is not staunchly in favor of a fast repeal of the law if Democrats take back control of Congress during the midterm elections later this year, according to the Burlington County Times. "We need to make sure that this is a process that brings in the American people and brings in experts and is done in a very deliberative, strategic way," Kim said Tuesday following a roundtable meeting with residents and business owners. "It needs to be done in a broader way. There’s not going to be any silver bullet to this," added Kim, saying that he wouldn't support rushing changes. "It would be irresponsible for us to think there’s a simple solution to these issues." Kim's most recent position differs from his campaign website, which calls for voters to "take action to repeal the Trump tax" and then hits his Republican opponent for voting three times for tax reform. Kim has also slammed the tax reform law on Twitter several times, calling it "disastrous," "terrible," and quoting Democratic Rep. Bill Pascrell (N.J.), who called it a "big wet kiss to corporate donors and a deliberate slap in the face to New Jersey." "MacArthur once again stood against his state, his constituents, and even his fellow New Jersey Republicans, to vote for the disastrous Trump tax plan. Check out the coverage to see exactly why I'm running to replace MacArthur in 2018, then join me!" Kim tweeted. "Terrible tax bill is hurting NJ more than any other state in the country and @RepMacArthur was the only one in NJ to vote Yes. Help me replace him," Kim tweeted. "We must remind people every day that Tom MacArthur was only NJ member of Congress to vote Yes on the Tax Bill. Thank you @BillPascrell for reminding us that tax bill "is a big wet kiss to corporate donors and a deliberate slap in the face to New Jersey," Kim tweeted. Kim received the tax break when he paid his bill in September 2017, even after he announced he was running for the 3rd District seat in Congress and was registered to vote as a New Jersey resident, where he was renting. Kim’s campaign has said the tax break was automatically renewed and that Kim canceled it and refunded the $687 in benefits he received before MacArthur’s campaign highlighted the oversight. 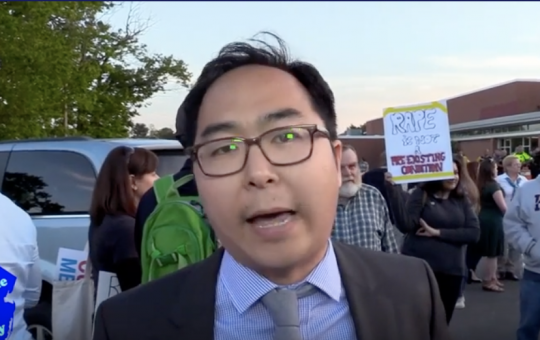 "Andy Kim either lied to get himself a special tax break, or he lied about his New Jersey residence to vote in the primary," said National Republican Congressional Committee spokesman Chris Martin. "Either way, Andy Kim launched his campaign by attempting to deceive the people of South Jersey." This entry was posted in Issues and tagged House Democrats, New Jersey, NRCC, Tax Reform. Bookmark the permalink.